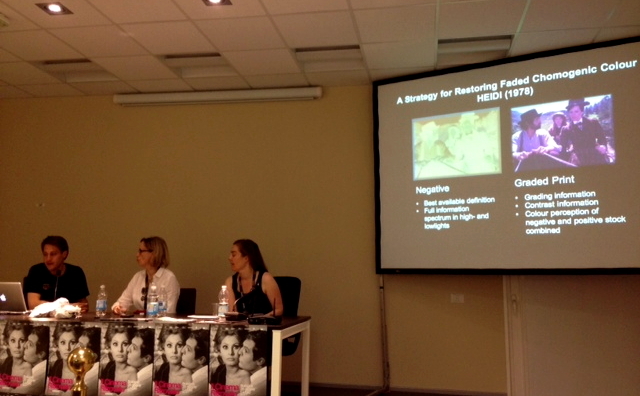 In the framework of the FIAF Summer School during the festival Il Cinema Ritrovato in Bologna, DIASTOR presented some of their research topics. 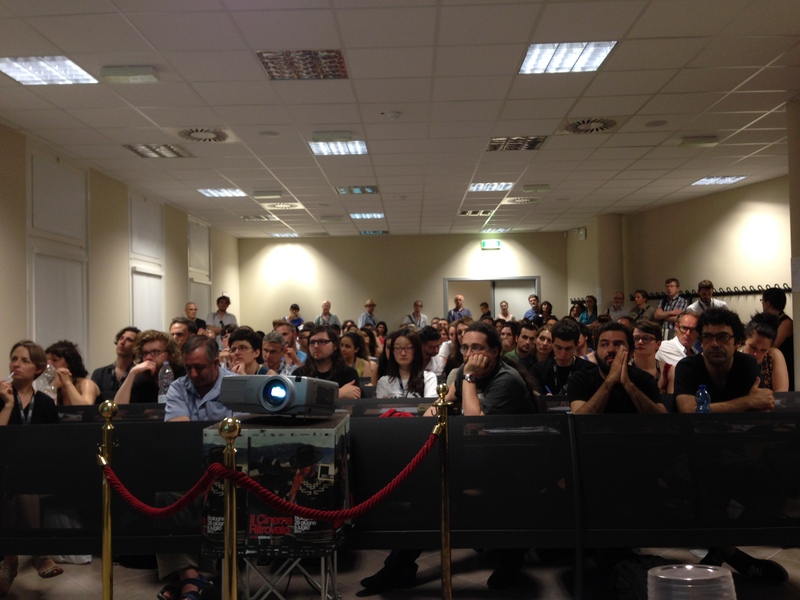 Despite many other attractive events that took place at the same time, the DIASTOR presentation met a huge amount of attention with a large audience attending. DIASTOR project Barbara Flueckiger started the talk with a presentation of the new design of Timeline of Historical Film Colors that was launched on that day. In addition to providing an overview of the information and the structure provided by the digital humanities platform, she presented the different ways to document color films. She then introduced DIASTOR and an overview of the case studies completed or currently under way, such as the color analysis for the CALIGARI restoration, the Swiss Technicolor No V production HEIDI AND PETER (CHE 1955), and DER MÄRCHENWALD, EIN SCHATTENSPIEL (GER 1919) in collaboration with Stiftung Deutsche Kinemathek, Berlin. Both early colors and Technicolor will be major topics in DIASTOR’s second year. Subsequently DIASTOR senior researcher Claudy Op den Kamp presented the restoration of the Dufaycolor film VOM SPINNEN UND WEBEN in more detail, with an emphasis on the scanning process. Dufaycolor – and additive screen process with a diagonal réseau in red, green and blue – is especially demanding, since the diagonal lines of the réseau interfere with the orthogonal pattern of the scanner sensor and can produce moiré artifacts. The setting of the focus is also crucial for achieving convincing results. DIASTOR’s scanner tests include Dufaycolor to study the scanner/film interaction with this demanding material. Claudy Op den Kamp explained the fruitful collaboration among the partners in DIASTOR, especially with the Cinémathèque suisse who provided the case study and collaborated closely on the restoration, but also with the implementation partner Cinegrell Postproduction where the 4K scanning on the ARRISCAN and the film-out including the photochemical processing of the preservation element took place. DIASTOR senior researcher David Pfluger presented one of the main research areas in DIASTOR, namely the reconstruction of faded chromogenic film. Many of the films shot on photochemical stock have faded due to the selective decay of the dyes used for the process. David Pfluger explained the novel approach in DIASTOR which is based on previous research by Franziska Frey and Rudolf Gschwind from the Digital Humanities Lab at the University of Basel. While Frey and Gschwind investigated the color reconstruction for still photographs, their approach needs to be adjusted and redeveloped for motion pictures. In contrast to established tools for the reconstruction of faded chromogenic film, DIASTOR’s approach takes the material properties of the film and the dyes into consideration by measuring the spectral properties of the dyes and investigating the characteristics of their decay. Finally this approach also requires the adjustment of the scanning process accordingly. For the subsequent Q & A, DIASTOR postdoc Franziska Heller and Caroline Fournier from the Cinémathèque suisse joined the panel and contributed their view. Franziska Heller explained in particular the interdisciplinary collaboration in DIASTOR where academic partners from humanities and natural science cooperate directly with partners from the private sector. Five minutes before the DIASTOR presentation starts the Auditorium is completely crowded and many more participants were joining the audience. DIASTOR team member David Pfluger explains the workflow for the reconstruction of faded chromogenic film. On the panel are also DIASTOR project leader Barbara Flueckiger and DIASTOR team member Claudy Op den Kamp. Der Regisseur Markus Imhoof schildert im Interview, warum er seinen oscarnominierten Film “Das Boot ist voll” zweimal fast verloren hat, welche Lehren er daraus zieht und wie die Politik aktiv werden müsste. Mit dem KTI-Forschungsprojekt DIASTOR hat er einen Plan zur Digitalisierung von fünf seiner Filme entwickelt und versucht gegenwärtig, die Daten von “Das Boot ist voll” zurückzugewinnen. Am 5. Juni 2014 führt DIASTOR in Zürich eine Tagung zur Digitalisierung, Sicherung und Bewirtschaftung von Filmen durch. Das Interview fand am 10. April 2014 in Berlin statt. We are very excited to announce that DIASTOR has a new partner! At the beginning of this week, Swiss Radio and Television SRF has joined the project as an implementation partner. SRF is the public broadcaster in the German part of Switzerland. With its huge archive of 16 mm films and a major library of Swiss movie classics on 35 mm, stored in the vaults of the Cinémathèque suisse, SRF is a perfect extension to DIASTOR. Not only does SRF provide their own in-house expertise in the fields of archiving and restoration, but also do they offer an additional institutional framework with different requirements. This allows the DIASTOR team to enlarge the scope of their research by including case studies with other exigencies both with regard to access and long-term storage. Since the start of DIASTOR we collaborate closely with SRF. One of DIASTOR’s case studies is the restoration of faded chromogenic stock of the famous HEIDI series from 1978. Furthermore SRF works with DIASTOR on the restoration of the Technicolor feature film HEIDI UND PETER from 1955, directed by Franz Schnyder. 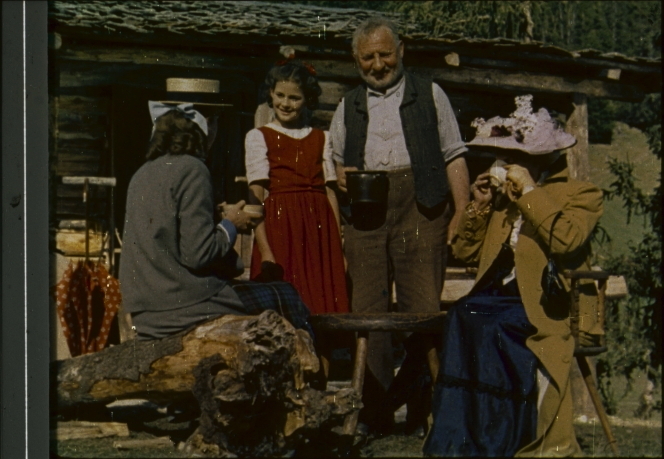 This Technicolor film will be part of DIASTOR’s project “Switzerland in Technicolor”. Several soundtracks were scanned at project partner sondor on the Resonances system that scans positive and negative optical soundtracks in real-time. An area of interest is determined (see red lines) and the track is cleaned up during transfer with a dedicated dust-busting plug-in. Particularly challenging in this instance was the Dufaycolor soundtrack, an additive colour filmstock with a red, green and blue reseau (for more information click here), which produces its own high pitch. The output files in these cases will form the basis for sound negatives for preservation purposes and future DCPs. We’re in the middle of testing and scanning some exciting film titles: Dufaycolor title PARURES (Switzerland, 1939) in collaboration with project partner Cinémathèque suisse; Technicolor title SWITZERLAND SPORTLAND (USA, 1952) in collaboration with Harvard Film Archive (both scanned at project partner Cinegrell Postproduction) and various early colour systems with Deutsche Kinemathek (scanned at project partner AV Preservation by reto.ch). Please note that these scans are the raw images before any correction has taken place. Come see the results at our conference in June and in the meantime watch this space for regular updates. 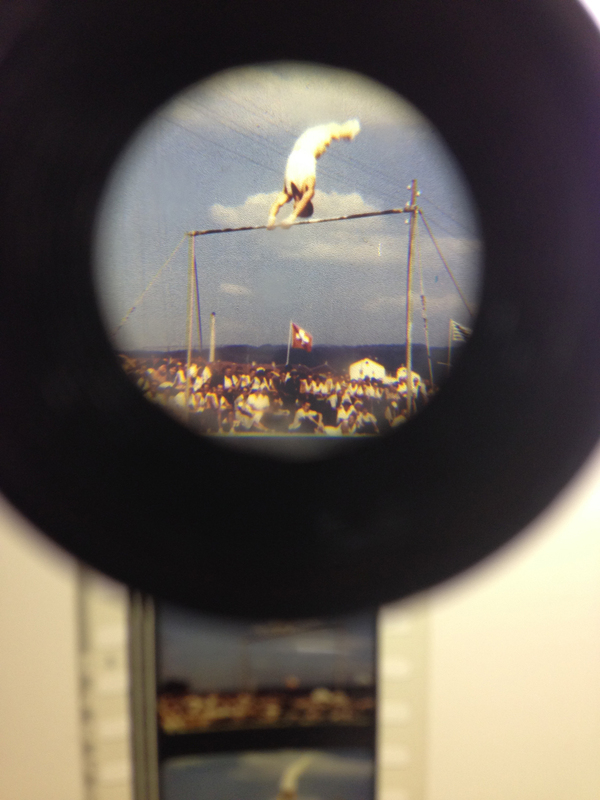 During the past four weeks, DIASTOR intern Manuel Joller worked at the Deutsche Kinemathek in Berlin to prepare a program of selected commercials and image films from the early color era. With support from Prof. Martin Koerber, Head Curator, Annette Groschke, Curator, and Eszter Takács they went through piles of nitrate film to find the most promising films for the DIASTOR digitisation and restoration case studies. The films will be presented at festivals and conferences in 2014. Check back to get more information about DIASTOR’s progress on these films. DER MÄRCHENWALD, EIN SCHATTENSPIEL, a beautiful live-action shadow play from 1919. By courtesy of Deutsche Kinemathek, Berlin. 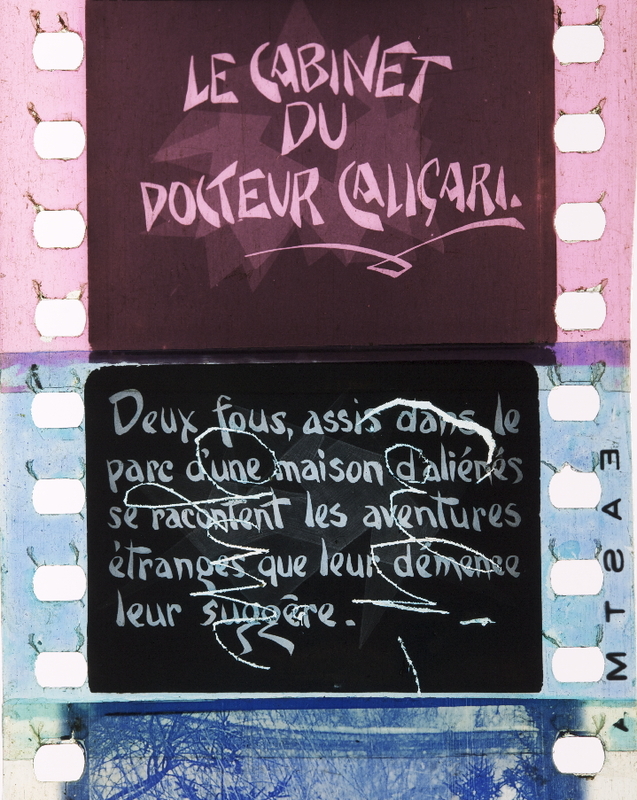 In the framework of DIASTOR’s color analysis for the restoration of “Das Cabinet of Dr. Caligari” five differently tinted and toned nitrate prints were documented photographically. The restoration by the Friedrich-Wilhelm-Murnau-Stiftung in Wiesbaden is currently under way under the supervision of Anke Wilkening at L’Immagine Ritrovata in Bologna (see previous posting here) and will have its premiere at the Berlinale Film Festival in February 2014. Tinted and toned nitrate print from the Archivo Nacional de la Imagen – Sodre, Montevideo/ Cineteca di Bologna. The first part of the photographic documentation by DIASTOR for the restoration of “Das Cabinet des Dr. Caligari” (Germany 1919) is now online. Credit: Copyright: Friedrich-Wilhelm-Murnau-Stiftung, Wiesbaden. Source: Cinémathèque française, Paris Film: Das Cabinet des Dr. Caligari (GER 1919, Robert Wiene). Harvard Film Archive joins DIASTOR for one of their case studies, the Technicolor short film Switzerland Sportland (1952). The film will be part of a more extended program entitled “Switzerland in Technicolor”. All the films in this program showcase not only a world-famous technology but also a wonderfully picturesque image of Switzerland. 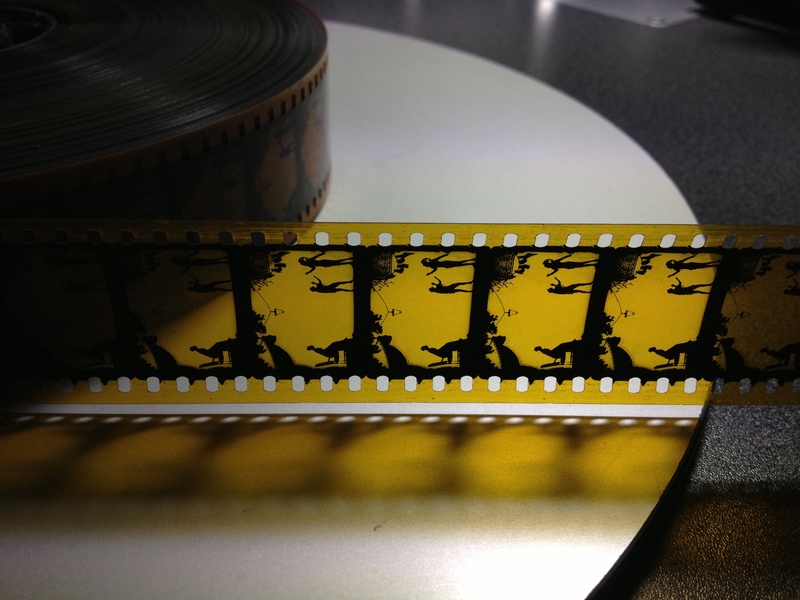 Based on their study of this selection of Technicolor films, the DIASTOR research team develops a workflow to digitize dye-transfer prints as faithfully as possible. As posted earlier, the DIASTOR team conducts a color analysis of a variety of tinted and toned nitrate prints of the famous German expressionist film “Das Cabinet des Dr. Caligari”. 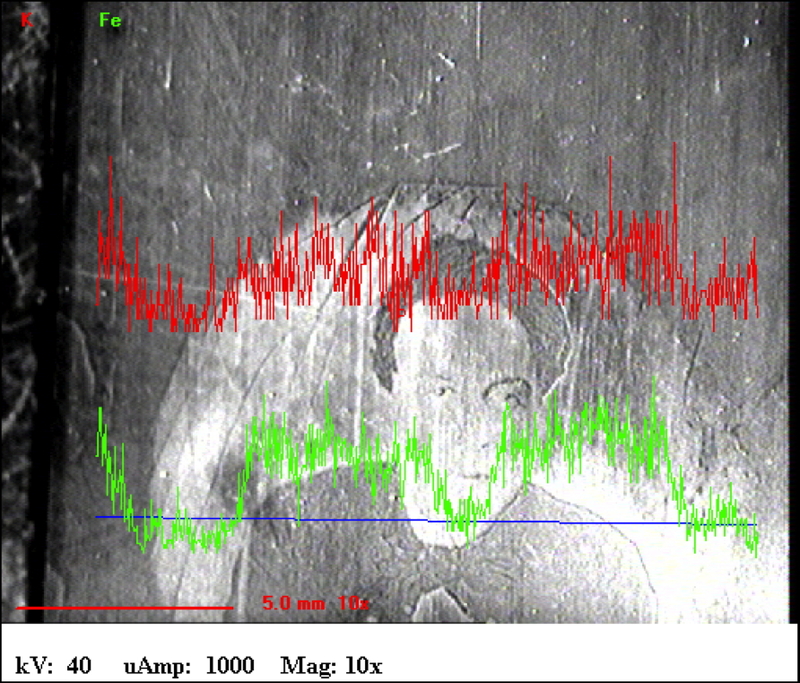 In addition to the photographical documentation and tests with various types of illumination (diffuse and collimated, different color temperatures), several analytical methods to determine the dyes and chemical compounds have been tested: Measurements with spectrophotometry, Raman spectroscopy, micro-spectrophotometry, spectral photography, semi-destructive laser ablation ICP, and X-ray fluorescence. The results of these tests will be presented on up-coming conferences.